Father Earth Organic Farm is a small family farm in east Boulder County, Colorado that provides quality, locally grown, organic vegetables, fruits, and herbs. We have both a CSA program and a farm stand. 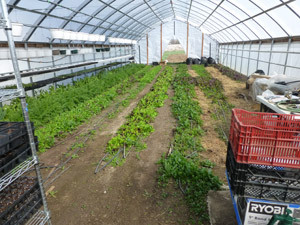 Over the past eight years, Father Earth Organic Farm has grown steadily in food production areas. 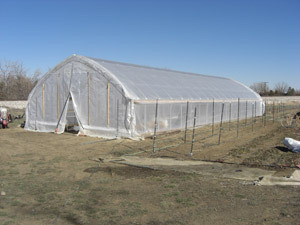 The latest addition is a 24' x 72' "High Tunnel" house. Through a partial grant from Boulder County Farm Service Agency (FSA) in conjunction with the Natural Resources Conservation Service (NRCS), I was able to build this Great House! 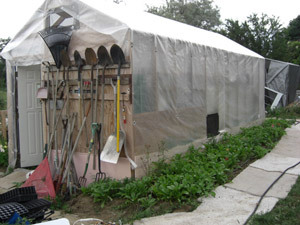 It took 20 plus volunteers and from May 2011 until October 2011 to complete. Some photos are shown here—along with photos of some smaller, but very functional, greenhouses and hoop houses. 2. 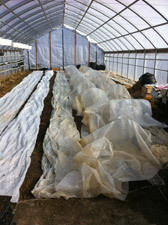 Inside Hoophouse—tomato plants in grow bags. 3. 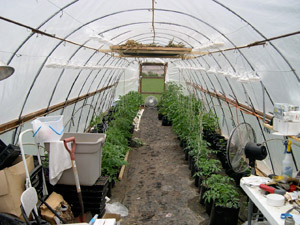 Full grown tomato plants in Hoophouse. 5. A-Frame House with tool storage rack. 6. 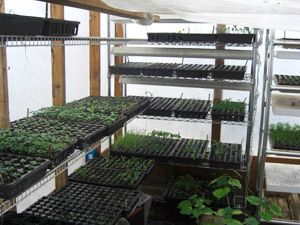 Inside A-Frame House—starter plants on wire shelves. 7. Leaf of cucumber plant in Hoophouse. 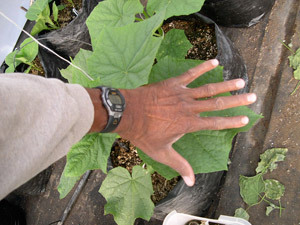 Large leaves produce great cucumbers. 8. 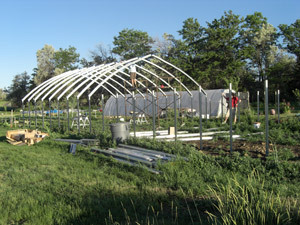 Construction of steel frame high tunnel house: June 2011. House is 24' x 72'. 9. 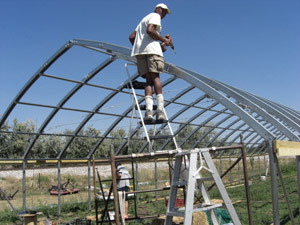 Owner assembling High Tunnel house during July through October 2011. 10. 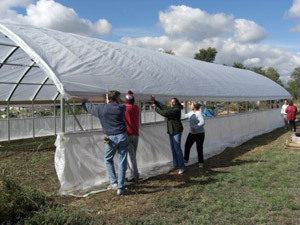 Volunteers helping put the cover on large high tunnel house in October 2011. 11. 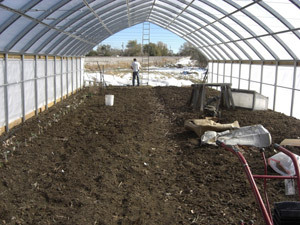 Preparing ground for planting in high tunnel house. © 2008 - 2019 by Father Earth Organic Farm. Father Earth Organic Farm is a small family farm in east Boulder County, Colorado that provides quality, locally grown, organic vegetables, fruits, and herbs. We have both a CSA program and a farm stand. 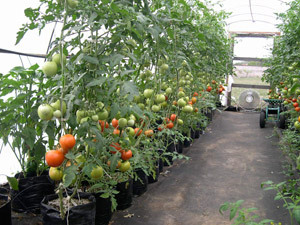 We offer hydroponically grown tomatoes and peppers. All of our produce is non-GMO. Father Earth Organic Farm is a small family farm in east Boulder County, Colorado that provides quality, locally grown, organic vegetables, fruits, and herbs. We have both a CSA program and a farm stand. 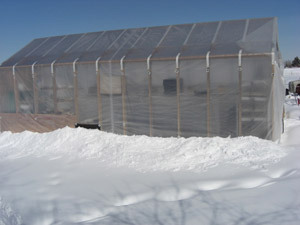 We offer hydroponically grown tomatoes and peppers. All of our produce is non-GMO. Father Earth Organic Farm is a small family farm in east Boulder County, Colorado that provides quality, locally grown, organic vegetables, fruits, and herbs. 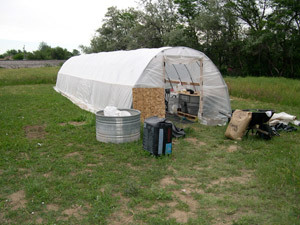 We have both a CSA program and a farm stand. 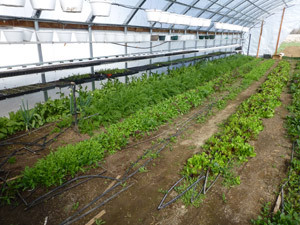 We offer hydroponically grown tomatoes and peppers. All of our produce is non-GMO.